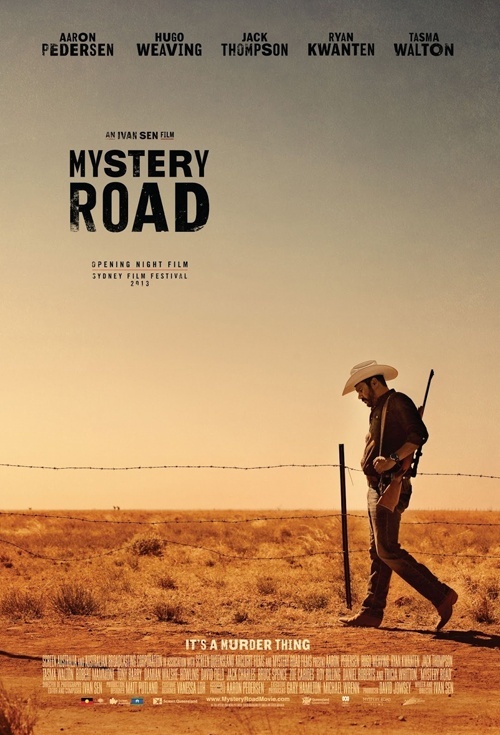 Mystery Road is a slow burn thriller with western elements set in the dusty Australian Outback. It’s a film that’s not afraid to take its time setting up the story, and its methodical pacing is both a blessing and a curse. Aaron Pedersen stars as Detective Jay Swan, an indigenous detective investigating the brutal killing of a teenage prostitute on the outskirts of a rural town. Swan is essentially alone in his efforts, an outsider mostly due to the color of his skin. The locals are unwilling to talk (unless there is some form of bribe), and the local sergeant (Tony Barry) says he can’t afford the extra manpower to help with the case. Others in the department, such as the mysterious Johnno (a scenery chewing Hugo Weaving), threaten him for stepping on their turf. As Swan works his way through the town trying to piece things together, the plot slowly begins to unravel. Other shady activities start to surface, such as the discovery of an underground prostitution ring, and it seems everyone has some sort of hidden dark side to them. There is a lot of ambiguity within the film, and it’s never truly clear what some of the character’s motives are. The deliberate pacing used during this procedural is a bit taxing at times, but at the same time it succeeds in building tension. It helps, too, that the payoff is well worth the wait. I won’t get into specifics, but the climax results in an extended shootout, one that makes tremendous use of the beautiful Australian Outback. The cinematography during the entire film is simply stunning. There are numerous wide shots that show off the gorgeous scenery, some of which evoke a similar atmosphere as found in No Country for Old Men. This really is a beautiful film, and the eye candy makes up for some of the slower moments. Aaron Pedersen proves to be a strong lead, delivering a rather stoic performance as a “cowboy detective”. His character is direct and to the point, and he never shakes his deadpan demeanor. He’s clearly there to clean up the mess left by so many others. The rest of the cast is stacked with familiar Aussie faces like Ryan Kwanten, Jack Thompson and Robert Mammone, though most have small roles. After all, this is all about Detective Swan. I am conflicted in recommending Mystery Road. It really could have benefited from some editing and better pacing, but it ends on such a high note that the conclusion alone makes up for some of its shortcomings. It also helps that this is a damn good looking film. At the very least it proves that director Ivan Sen is one to keep an eye on — I would love to see what he could do with a bigger budget. My friend Josh reviewed this for me from MSPIFF! Looks pretty darn good, I definitely would rent this when it’s out on rental. 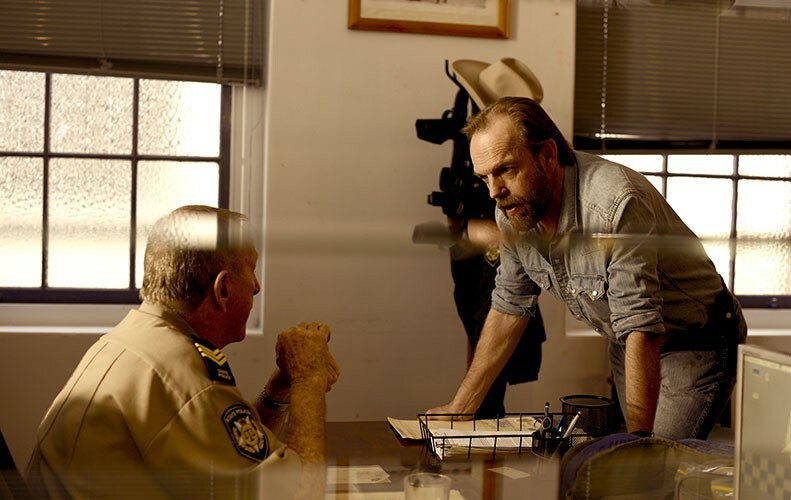 I usually like Hugo Weaving’s work. It was Sir JJames’ review that pushed me to see this yesterday. 🙂 Definitely a solid flick. I think you’ll get a kick out of Hugo Weaving in this, too — he’s a bit over-the-top but really enjoyable. I’ve considered giving this one a try, but I’m not sure just yet and your review didn’t help either cause. By the way, great new look and glad to see you’ve kept busy while I was away from the blogosphere. Hey Niels, great to hear from you. Mystery Road is worth a look if you enjoy brooding, atmospheric thrillers, though at times it is too methodical for its own good.